The people of Swaziland—a small, landlocked nation in southern Africa—have among the worst life expectancy measures in the world, a result of the twin epidemics of HIV and tuberculosis. While much has been done to confront HIV among pregnant Swazi women, fully 41 percent have the retrovirus. And while high-quality HIV health services and evidence-based treatments are widely accessible at primary healthcare facilities in Swaziland, it remains difficult for women and their families to remain in long-term treatment. El-Sadr is a leader among a cadre of scholars intent on identifying the most effective means for translating public health evidence into practice. Working around the globe with their in-country partners, such researchers are developing packages of interventions to support long-term care for people with HIV; documenting, testing, and comparing the effectiveness of tactics to improve health outcomes; and creating programs designed for resource-constrained settings. In the process, they’re piloting and scaling up evidence-based approaches to public health promotion that can be tailored to reflect local customs, cultures, and resources. Not to be confused with the implementation of programs, implementation science—an approach that El-Sadr has championed in the U.S. and abroad—tests methods for spurring the uptake, implementation, and translation of research findings into routine and common practice. In Swaziland, for example, ICAP is testing the best methods for linking people with HIV to ongoing care and helping them to stick with it. Among the approaches under investigation are additional testing to estimate the risk of complicating infections, accelerated initiation of HIV treatment, appointment reminders sent via mobile phones, provision of care and prevention items like condoms, and noncash financial incentives to cover the cost of travel to clinics. The challenge of bridging the gap between public health scholarship and health outcomes often boils down to a single question, says Sara Abiola, PhD, JD, assistant professor of Health Policy and Management: “How do you change the environment so that people can engage in healthy behaviors?” A Harvard-trained lawyer with a doctorate in health policy, Abiola investigates how legislative interventions can help prevent chronic, noncommunicable diseases—especially those related to food, alcohol, and tobacco—around the world. 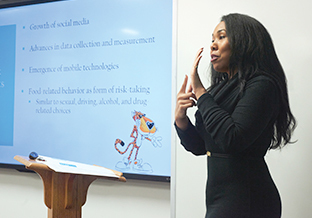 Using a quantitative scoring system developed in her own research group, Abiola and her team rate each country’s response to a number of public health challenges. The team’s tobacco index, for example, rates seven categories linked to the leading cause of preventable deaths worldwide—such considerations as how tobacco sales are administered and what consumer warnings are legally mandated. As the subject of a binding treatise from the World Health Organization, which requires member nations to take specific action to address smoking, tobacco has been the subject of an array of legislative efforts to boost awareness, restrict availability, and promote access to programs that can help citizens kick their addiction. But not all legislation is created equal, as Abiola and her team are documenting. A child with pneumonia struggles to breathe. Her nostrils flare, her lips develop a blue tinge. What happens next in this frightening emergency scenario depends on the healthcare setting and the available resources. 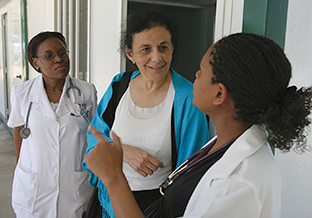 At a university hospital, a physician specialist might insert a tube into the child’s trachea and connect it to a mechanical ventilator; at a community clinic, a nurse might give the child antibiotics and refer her to a higher level of care. In the absence of adequate treatment, pneumonia claims the lives of more than 2 million children under the age of 5 every year. Associate Professor of Emergency Medicine and of Population and Family Health Rachel Moresky, MD, MPH, had a theory that—in the absence of expensive high-tech equipment and specialists to operate it—a simpler, cheaper intervention, performed by trained nurses, could save lives. To prove her theory, Moresky and her colleagues in Ghana studied the training of nurses at first-level hospitals in rural parts of the country on how to use continuous positive airway pressure (CPAP) therapy to relieve respiratory distress in children under 5 years of age. 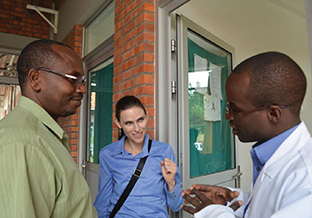 The research, developed in Ghana and scaled as a training program in Cambodia, Honduras, Kenya, and Rwanda, is “task sharing with supportive supervision,” says Moresky. Many lifesaving interventions are reserved for highly trained specialists, she notes. But when such tasks are shared by healthcare workers in conjunction with supportive supervision, she says, more lives can be saved at facilities closer to a patient’s community. Health and environment reporter Alison Fromme contributed to The Science Writers' Handbook.